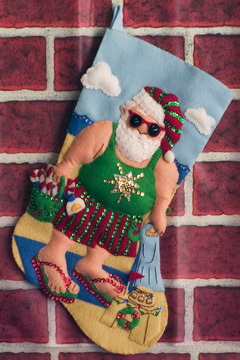 Sue Koont donated a Santa stocking for the "Gifts of Aloha" silent auction fundraiser at Details Gallery, continuing through Dec. 16. Riding the tide of goodwill this time of year, Details Gallery got together some local artists and businesses to play Santa for Parents and Children Together (PACT). The fundraiser's theme, fittingly, is Christmas stockings, which the artists have created and donated. The stockings and other items are up for silent auction, through Dec. 16, at the gallery. The stockings are both traditional and not -- some bear cheery Christmas themes, while others, made of such materials as camera film and flowers, display the wild imagination of the artist. Gallery manager Emily Catey says that while the stockings themselves are fun to see, the real point of the auction is what's inside them. Businesses have donated gift certificates for restaurants, jewelry stores and tickets to stage productions, and those are tucked away in the festive artwork. In addition, some artists have donated art pieces rather than stockings, which add to the list of biddable items. Details Gallery is located at 1142 Bethel St. in Chinatown. Gallery hours are 11 a.m. to 5:30 p.m. Mondays to Fridays and 11 a.m. to 3 p.m. Saturdays. Call 546-8000 for more information. PACT is a nonprofit family services organization that is involved in everything from Head Start and the Family Peace Center to domestic violence shelters. 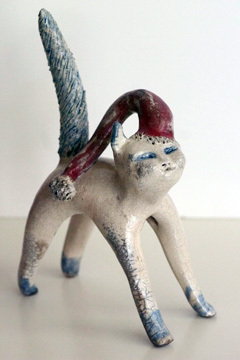 Susan Hogan's ceramic cat, "Noel." 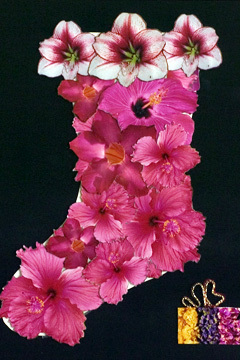 Karen March played on the stocking theme and created a flower stocking photograph for "Gifts of Aloha." 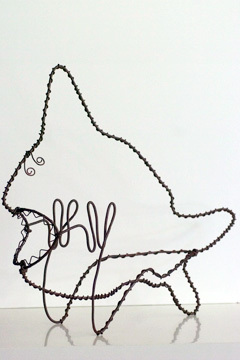 "Mano" by Kalani Wilson, a wire shark, is among the donated artwork up for bid. 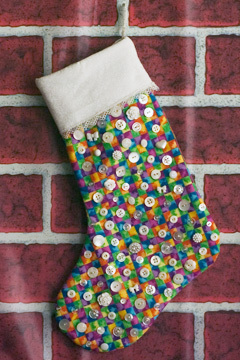 Sue Koontz used dozens of buttons for her more traditional stocking creation.